Free Shipping On $75.00 Orders US States! We ship to USA, Canada & Australia. We have the best shipping prices! Blind & Shade Restringing kits!!! We offer everything you need in one easy to use kit to completely restring your window covering. 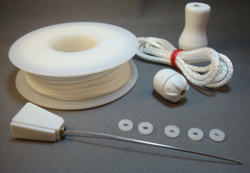 Blind Parts NW offers Blind Cord, Shade String, Tassels, Tilt Gear Wands, Tilt Gears, Ladder String Tape, Cloth Tape, Mounting Brackets, Pleated Shade String, Blind String, Continuous Cord loop, and more! Broken Tilt Gear or Cord on your 2" Venetian blind. Come and browse through our selection of Old Blind Parts. From Cloth Venetian Blind Tape to Lift Cord. String & Restring Parts for All RV Day-Night Shades. Repair your blind or shade for a fraction of the cost of new ones. Need a replacement part for your RV shade you'll find it here. We can provide parts for your RV day/night shade and hold-down for your RV Blind. We have most brands, styles and types of blinds and shades repair Parts. We carry a full selection of Quality Parts And Accessories For RVs, Motor homes, Travel Trailers, Conversion Vans. We are your source for window covering replacement parts for your RV Day/ Night Shades. We specialize in hard to fine RV window covering parts. We also offer restringing kit for your conversion vans and RV. 2.8mm Cord Loop Used on Hunter Douglas and Graber blinds and shades with the Easy-Lift system and RollEase system. We have replacement parts for you continuous cord loop pleated and honeycomb in several diameters and drop lengths. We offer a mail in service for Restringing among many other repairs for your window coverings. We have great prices along with quick turn around time. Window covering mail in repair service information.